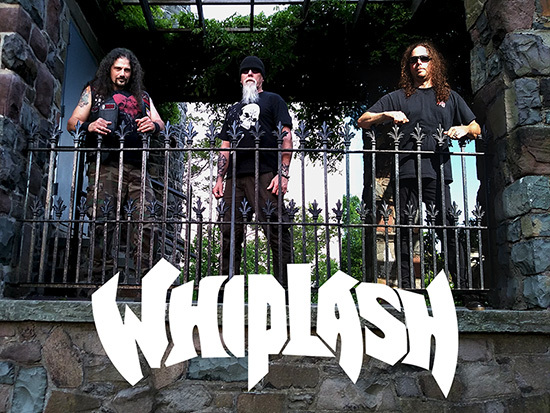 Metal Blade is very happy to welcome East Coast thrashing legends WHIPLASH to its ranks! WHIPLASH is an original thrash metal band, and Tony Portaro delivers over 30 years of power thrashing death. Known for his lightning speed riffs and leads, Portaro heads a power-trio lineup delivering metal old school style. WHIPLASH exploded onto the US metal scene in 1984, branding the East Coast with its original thrash sound. Debuting its Roadrunner release “Power And Pain” at Ruthie’s Inn, Berkeley, CA, they followed it with two additional releases, “Ticket To Mayhem” and “Insult To Injury.” From its East Coast thrash beginnings, WHIPLASH claimed its place in the metal archives. As a New Jersey native, Tony Portaro made his chops at NY clubs, including CBGBs and L’Amour. Always attracting talent, Portaro led band members through various incarnations of WHIPLASH, always trying to realize the musical vision he heard in his head. Producing four more WHIPLASH records through 2009, WHIPLASH stamped its way around the globe, gaining thrash followers whose ranks still grow to this day. WHIPLASH have recorded a full new album and in order to get a more old-school sound, Portaro opted to record to 2″ tape. Also, with the advice of renowned mastering engineer, Maor Appelbaum (Faith No More, Halford, Armored Saint, Sepultura, Candlemass, Anvil, Goatwhore) he chose to have the mix done by Phil Anderson, a long-time collaborator of Maor. Phil mixes on an analog board which should further benefit the project and push it in the direction Portaro is looking to reach. Besides Tony Portaro, WHIPLASH consists of bassist Dank Delong who had been recruited by Portaro in 2010. Dank Delong’s presence onstage was undeniable. Dank’s energetic and animated stage performance continues to be electrifying, as he wields his formidable bass missile-like and over his head! He is a long-standing member and VP of the world-wide metal support club, NYDM – Rockland. Ron Lipnicki’s thrash injection to WHIPLASH in 2018 would begin a new era for the band on Metal Blade Records. Hailing from New Jersey, Ron’s drum skills need no introduction, coming off a 12 year run with OVERKILL, and before that, hitting it with HADES. With his precision guns firing, Lipnicki obliterates the kit while setting rapid-fire pace! This is thrash – this is WHIPLASH thrash! WHIPLASH continues to bring old school thrash to a new generation of metal heads. THRASH ‘TIL DEATH! Stay tuned for more updates on the new album which is about to drop in early 2019!